As if tick bites did not cause enough problems already; it has now been proven that tick bites also lead to red meat allergy that can even turn life threatening in some cases. Many cases of tick bite meat allergy have been reported not just in parts of United States but also in other countries including Japan, Germany, Sweden, Australia, Spain and Korea. What happens in tick bite meat allergy? It starts with a person eating a burger or a steak as usual, but suddenly develops a severe allergic reaction in the form of hives (or even ends up with anaphylactic shock). Many patients have had to go to the emergency room following such episodes. Such reactions have been reported in people who have never had allergies before and have been eating red meat and dairy products all their lives. Further investigations reveal that the individuals were invariably bitten by ticks a few months prior to the incident. 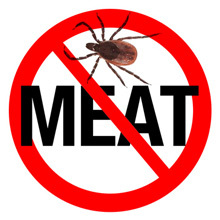 Typically, the tick variety causing such allergic reactions to red meat is the Lone Star tick which is seen in many regions across the United States, Australia and Europe. Why does the lone star tick lead to red meat allergies? The probable reason behind the tick bite meat allergy is the presence of enzyme in ticks’ saliva called Alpha-Gal. This compound is absent in humans but is present in red meat of animals including lamb, beef, pork, venison, rabbit etc. It is also present in dairy. People normally digest this enzyme when it is encountered through food. However, once a tick bites an allergic person, their bodies trigger an auto immune response to fight the Alpha Gal enzyme by releasing anti bodies. The next time they eat red meat, the body immediately recognizes the enzyme in the meat as harmful. The result: a severe allergic reaction characterized by swelling of face, tongue and throat, hives, painful itchy rashes on hands, inability to breathe, and other respiratory distress. The signs are typically seen 4 to 6 hours after ingesting red meat. Trials were conducted on nearly 25 patients brought in with such allergic signs. Most of them lived in parts of Sydney that were known to be infested with ticks. 24 out of the 25 patients reported having had an encounter with tick bites. The trial group also reported other allergic signs after they were bitten” these included lesions, delayed onset of pruritis (or skin inflammation) and pain at the site of the bite. The bites had occurred nearly 1 to 6 months prior to the developments of tick bite meat allergy. Most patients reported that the tick causing the bite was nearly 3 to 10 mm in length with a hard shell covering. Most of these patients had not reported any allergic reactions to other insect bites such as mosquitoes, honeybees, wasps etc. Blood tests were then conducted on these patients. These helped researchers estimate that Bovine serum albumin and IgE antibodies produced in reaction to alpha-galactose enzyme were probably the reasons behind such delayed immune response and anaphylactic shocks. In many cases reported in the United States, the exact cause of the allergic reaction to red meat was not determined immediately. The patients were simply pumped with steroids and sent home. As a result, they continued consuming red meat and dairy, not knowing that they had now developed tick bite meat allergy. The best thing to do if you feel you have developed tick bite meat allergy is to get a confirmatory blood test. These include skin prick tests and/or fluoro enzyme immunoassay test. Experts also caution that if you have developed tick bite meat allergy the best thing to do is to avoid red meat and dairy products all your life. It is also essential that you prevent further tick bites. Lyme’s disease, ehrlichiosis and potentially fatal Tularemia can also occur. These conditions need to be treated with antibiotics. For milder symptoms of tick bite meat allergy, take anti histamines like Benadryl, Cetrizine etc. Avoid walking in grass and woody trails. If you do, make sure to wear long sleeved clothing, full pants and shoes with socks. Treat clothing and exposed body parts with DEET sprays, lotions or other insect repellents. Always check yourself and your family members for ticks. If ticks are present, remove them with tweezers and not bare hands. Make sure you squeeze the tick out from its head and neck so that its parts do not get left behind in the skin. People who have developed tick bite meat allergy can normally eat white meat like chicken, seafood and turkey etc.